On October 14, 2017, what appears to be a comet (er, make that asteroid…read more below) sped past Earth at a distance of about 15 million miles after swinging around the Sun. It had come within 23.4 million miles of our home star over a month earlier on Sept. 9, and in fact wasn’t spotted by astronomers until Oct. 18—four days after its closest pass by us. Further observations showed that the approximately 525-foot-wide object (an estimate based on its reflectivity) first approached traveling 16 miles a second from the direction of the constellation Lyra—quite a high angle from the plane of the rest of the Solar System—and is on a hyperbolic trajectory, moving quickly enough both in- and outbound along its course to permanently escape the Sun’s gravity unlike any other comet asteroid ever observed. Named C/2017 U1 PanSTARRS* (after the Pan-STARRS telescope on Maui which was used to first identify it) the object may be, based on its behavior, the first interstellar comet asteroid ever seen—a visiting world from completely outside our Solar System. Read more and see an image of the object on Sky & Telescope here and from NASA’s Jet Propulsion Laboratory here. *UPDATE 10/26/17: Further analysis of observations from the VLT in Chile performed by Karen Meech at the University of Hawaii show that C/2017 U1 is not exhibiting typical cometary behavior—e.g. formation of a coma or tail—and as such its designation has been changed to A/2017 U1, denoting more of an asteroidal nature. Still, its trajectory implies an extrasolar origin but now this also makes it the first comet to be reclassified as an asteroid (as opposed to the other way around)! *UPDATE 10/27/17: The hyperbolic trajectory of A/2017 U1 has been confirmed—this <400-meter asteroid (or comet or whatever it is) is a visitor from outside the Solar System! “We have long suspected that these objects should exist, because during the process of planet formation a lot of material should be ejected from planetary systems. What’s most surprising is that we’ve never seen interstellar objects pass through before,” said IfA astronomer Karen Meech. Read more from the University of Hawaii’s Institute for Astronomy here. 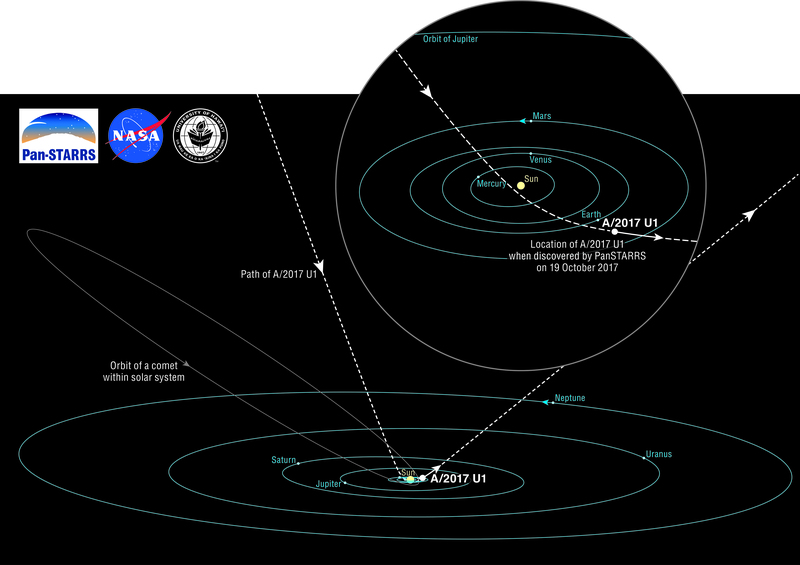 Diagram of A/2017 U1’s orbit through the Solar System. Credit: Brooks Bays / SOEST Publication Services / UH Institute for Astronomy. Scary that we only saw it after it was past us. And if it stops and parks up we might have a problem!